Full Price: $ 14.95 50% off! 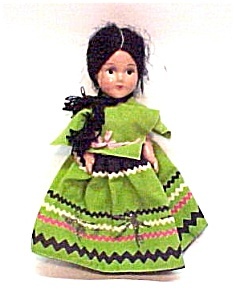 Composition Doll Spanish Mexican Peasant Girl. This pretty gal is 9 inches tall. She is entirely composition material, all in very nice condition accept for her feet. There is a pin head sized nick on one toe, the other has a .25 inch chunk off the end of her foot. Her facial features are hand painted and very nice. Her face has a couple scuffs and light soil, apin prick to end of her nose. Glued on sparkle earrings. Hair is a satin like stringy material, some is loose, needs to be smoothed and fastened down. Her clothes are cotton, white under things, Lime green skirt with printed ric rac and glued on sparkles. Top is a poncho with pale pink satin bows. Clothes have light soil. Red painted on shoes. She has a lovely face, a very pretty little doll.